New dock designs intended to reduce damage to salt marshes are not much better than traditional docks, according to a recently completed study by Clark Alexander of Skidaway Institute of Oceanography. Alexander also concluded the compass orientation and height of a dock has more impact on the health of the salt marsh than the dock design or materials. The problem is the shadow docks cast on the salt marsh vegetation beneath them. The marsh grass (Spartina alterniflora) does not flourish in reduced sunlight. In recent years, alternative materials and designs have appeared on the dock-building market to try to mitigate this problem. Alexander tested three types of alternative material and designs – ThruFlow fiberglass-impregnated plastic grating; Gator Dock Fibergrate grating; and the DockRider Sundock, which uses a set of wooden rails and an electric trolley in place of traditional wood planking. To answer that question, Alexander conducted a three-year, two-part research project funded by a $195,488 grant from the Georgia Coastal Zone Management Program. The first part of the study was to conduct field-based “before-and-after” studies of salt marshes where some of the new designs were being built. Alexander’s team collected samples and recorded conditions in the marsh before the docks were built and continued to monitor the salt marshes after they were completed. In the second part of the study, Alexander and his team constructed four dock models, “mock docks”, using alternative materials on high ground at the Skidaway campus. The docks were placed in a field with unobstructed sunlight and were fitted with light meters that measured the amount of sunlight being received above and below each dock. The researchers measured the shadow footprint of the various dock designs over the course of two years. 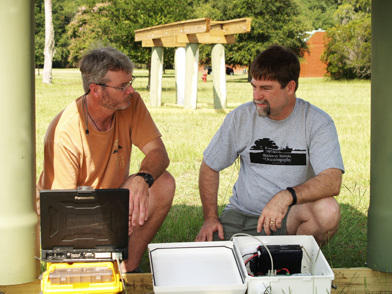 Clark Alexander (r) and research team member Mike Robinson examine the light meter equipment beneath on of the mock docks. “Because orientation is an important parameter in light transmission through these materials, we made the mock docks mobile, so we could re-oriented them during the four seasons to see the effects of orientation and seasonal sun angle” said Alexander. They also adjusted the dock heights to assess the impact of height on light penetration to the ground below. In the first part of the study, Alexander and his team examined three separate field sites – Turners Creek (ThruFlow decking), Shell Point Cove (Dockrider) and Betz Creek (traditional plank design) They measured the stem density of the marsh grass before the docks were constructed and then monitored it for two years after construction. Stem density in the dock shadow footprint decreased between 44 and 80 percent compared to nearby, non-dock sites. The team also observed additional dock-related impacts. Some sections of salt marsh transitioned to denuded mudflats due to the marsh wrack that accumulated around the dock pilings. The results of the field study were supported by the mock-dock project on the Skidaway campus. Seasonal measurements showed a significant reduction of the light needed to support the health of the marsh plants in the areas affected by the docks’ shadows. At Skidaway Institute’s latitude, the elevation of the sun is high enough to allow sunlight to penetrate through the grated deck material only during the spring and summer, and even then, provides only about 10% more light than traditional plank decking. The mock-dock project also documented two additional dock-shading impacts. The compass orientation of a dock plays a significant role in the effect the dock has on the marsh. Docks that are oriented in a generally north-south direction have a much smaller shading impact than those oriented east-west. The height of the dock also has a significant effect. The duration of the shadow under the dock and the total light loss decreases as the height increases, up to 7 feet above the marsh surface, with smaller, less significant decreases above that height. The results of the study have been sent to the Department of Natural Resources, which will use these results to better manage the important coastal saltmarshes of Georgia.